Today is our blogiversary. It’s hard to believe it’s been four years since we posted our very first article on What’s Your Grief. Back then we were averaging about 27 page-views a day and 24 of them were us + family and friends. But now, thanks to you, WYG has become a beautiful, quirky, grief-y corner of the Internet that we love more than we have words to express. We love the dialogue and discussion around grief that people have in the comments on our articles and on social media. We love the creative expression of grief that comes through Photogrief and Grief in Six Words. We love when people take the leap to sign up for a grief eCourse, even though they’ve never taken an eCourse before. We love that you tolerate our typos. We love that we aren’t the only ones who believe there’s room for online support to supplement all the great in person grief support that exists. We love our grief friends, new and old. We’re so happy with what WYG has become today, but we have to keep our eyes on the future. This year has been an especially big for WYG because Eleanor and I have both left the security of full-time jobs to focus on What’s Your Grief. In the past WYG was an expensive, time-consuming hobby, something we did on the side of our full-time jobs. As WYG grew, though, we realized that in order for us to keep it a safe, reliable, growing, and engaging space we’d need to give it our full time and attention. It has been terrifying and exciting. This means that 2017 is a make or break year for us. In order for us to keep WYG going and to continue to grow, we have to pay the bills. We’re not funded by an organization; we don’t receive grant funding. We’ve decided to keep the space free of advertisements. And, alas, there’s no independently wealthy philanthropist paying the bills (but if you know someone, send them our way!). It’s just the two of us, piecing things together, trying to make it work. We sell print grief resources in our store, we speak at conferences, we do trainings for organizations and professionals, we charge tuition for a limited number of eCourses, and once a year we come to you, hat in hand, and ask for a contribution. So here is our official ask: If WYG has helped you in your grief at all, if you have found comfort or support here, if you have felt a little less alone or a little less crazy, please consider a contribution to keep us going. We have so many ideas for how we want to keep WYG growing. We want more and more grievers to find support here. We want more and more ways for people to cope and connect and get information and for support to always be available. Anything you can give will help us to achieve these goals, whether it is $1 or $1,000. Nothing is too big or too small. Instead of dedicating space to annoying ads on our sidebar, we have a link to a page where we recognize all those who contribute (unless you give anonymously). You can give in memory of someone you love; you can give anonymously, or you can just give from yourself because you’re awesome. 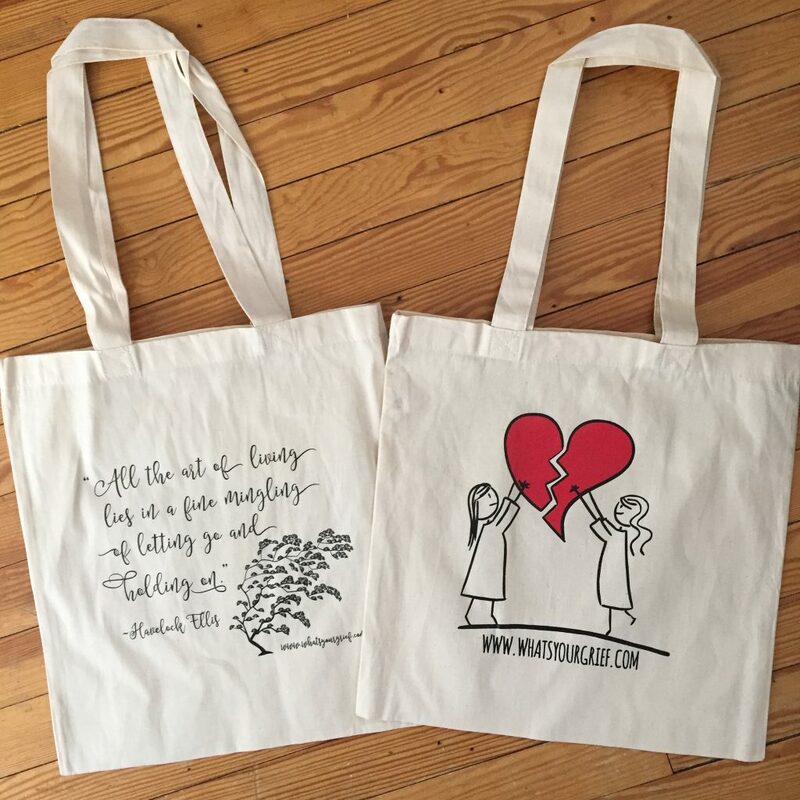 If you donate $50 or more we will send you a reusable tote bag of your choosing as a thank you. Click here to make your contribution to WYG . 6 responses on "Help us keep What's Your Grief going"
This 2016 Christmas I wanted to honor my Mom & Dad. I lost them both this year, 45 days apart. Mom has sent Xmas greetings all her life. She always wrote a wonderful, personal note on each card. So I purchased 100 cards from WYG. I used Mom’s address book as well as the memorial list from their funerals and sent cards to all of their friends. On the back of the card I wrote “In loving memory of my Mom & Dad”. I have received several beautiful notes in response with wonderful messages. It was my way of honoring my parents in order to make it through the first Christmas in my life without them. I’ve leaned on the wonderful devotionals and support from WYG for a year now. I can’t tell you how much you all have helped me! And when my Christmas cards arrived they were accompanied by a personal, handwritten note from Litsa thanking me for supporting WYG with my purchase of the cards and wished me well as I worked my way through the holidays. I want to say Thank You to Litsa and Eleanor! Thank you for this lovely site. I wonder if you’ve considered using Patreon to help people give what they can? I’m not affiliated with it- it’s a company owned by two brothers. I see a lot of people using it on their blogs and sites. Dear Litza and Eleanor, When our son died just over a year ago we were wonderfully supported by family and friends, so did not feel alone in our deep grieving. However, when we found you we felt supported in a new way, with ideas, understanding, your delightful senses of humor….In addition, we then had something to offer other grieving friends: the WYG blog. This Christmas our gift to our beloved son Steven is a small donation to support you so you can keep supporting others. Thank you so much. Thank you! Love your style. I feel I have found a kindered spirit with you all. Sending hugs… as I feel I receive hugs from you all every time I read a blog!